Založena v r.1994, ústředí USA Atlanta, akvizice ISS v roce 2006 Orientována čistě na bezpečnost, průkopník a vedoucí společnost na trhu IDS/IPS zařízení a vulnerability managementu Vlastní výzkumný a vývojový team X-Force Přes 1200 zaměstnanců, zastoupení v 25 zemích, provozuje celosvětově, 8 Security Operation Center Příjmy 330 MIO USD za r.2005, přes 11 tisíc Korporátních zákazníků IBM Internet Security Systems X-Force research and development team The X-Force research and development team is the foundation of IBM Internet Security System's preemptive approach to Internet security. Founded in 1997, the X-Force team is the oldest, best-known commercial security research group in the world. This leading group of security experts researches and evaluates vulnerabilities and security issues, develops assessment and countermeasure technology for IBM Internet Security Systems and educates the public about emerging Internet threats. The X-Force team provides IBM Internet Security Systems with the ability to stop more threats because of its knowledge base of information—understanding the tools and techniques used to create attacks and collaborating with government agencies, industry consortia and software developers. 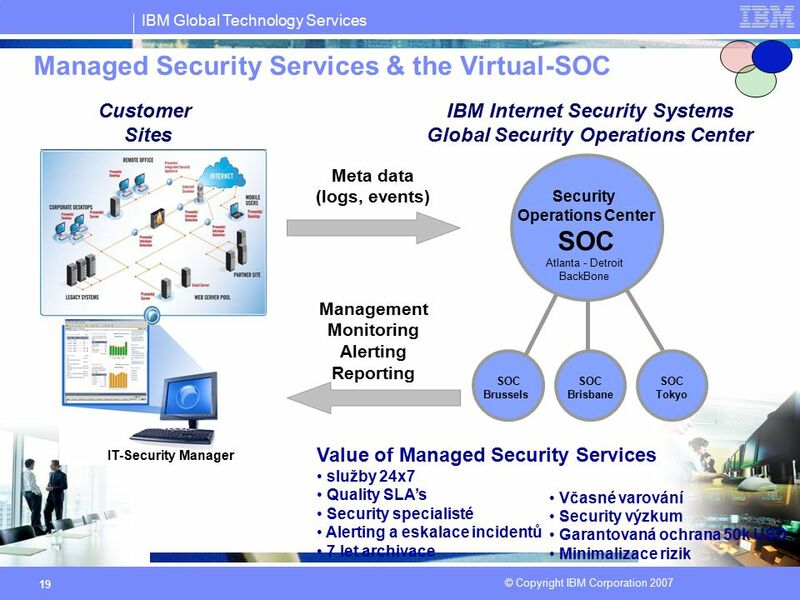 X-Force security intelligence, combined with 24x7 threat tracking and analysis through the IBM Internet Security Systems security operations centers, helps ensure that IBM Internet Security Systems stays ahead of the threat. X-Force Innovation - The X-Force research and development team leverages its superior understanding of vulnerabilities and exploit methods to develop the engines that make preemptive solutions possible, protecting against entire categories of vulnerabilities instead of creating signatures for specific exploits. - The X-Force team discovers and analyzes previously unknown vulnerabilities in critical software and infrastructure such as , network infrastructure, Internet applications, security protocols, business applications and Voice over IP (VoIP). - The X-Force team augments its own findings by collecting data from multiple research sources, researching publicly disclosed vulnerabilities and underground or irresponsibly disclosed 0-day vulnerabilities and analyzing proof-of-concept and exploit code. - The X-Force team monitors and analyzes global Internet threats 24x7 and provides updates on the current global Internet threat level in real time. - The X-Force Vulnerability Database is the industry’s largest and most authoritative vulnerability database. Containing approximately 30,000 entries, with more than 5,100 added in 2005, it includes detailed analysis of every notable public vulnerability disclosure since 1994. - The X-Force team discovered 51 percent of the high-risk vulnerabilities found by commercial security research groups from 1998 to 2005, including the vulnerabilities exploited by the Slammer and Zotob worms. - The X-Force team collaborates with thousands of the world’s leading businesses and governments, vertical sector information sharing and analysis centers (ISACs), global coordination centers and other product vendors. 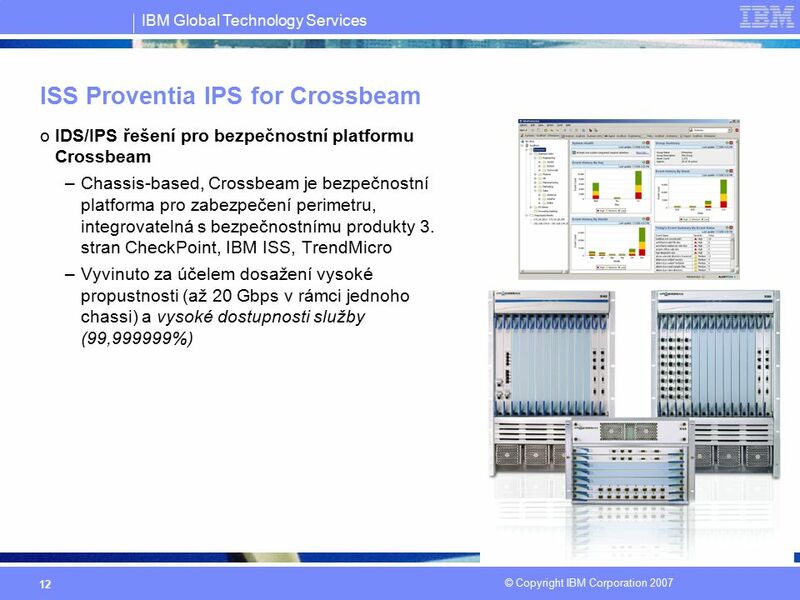 IBM Internet Security Systems X-Force® R&D tým: Přední světová bezpečnostní organizace, Založena v roce 1997 Nejstarší a nejznámější komerční výzkumná skupina zaměřená na detekci zranitelností a vyhledávání bezpečnostních slabin X-Force stojí za objevením více než 50% všech významných slabin v OS a aplikacích. 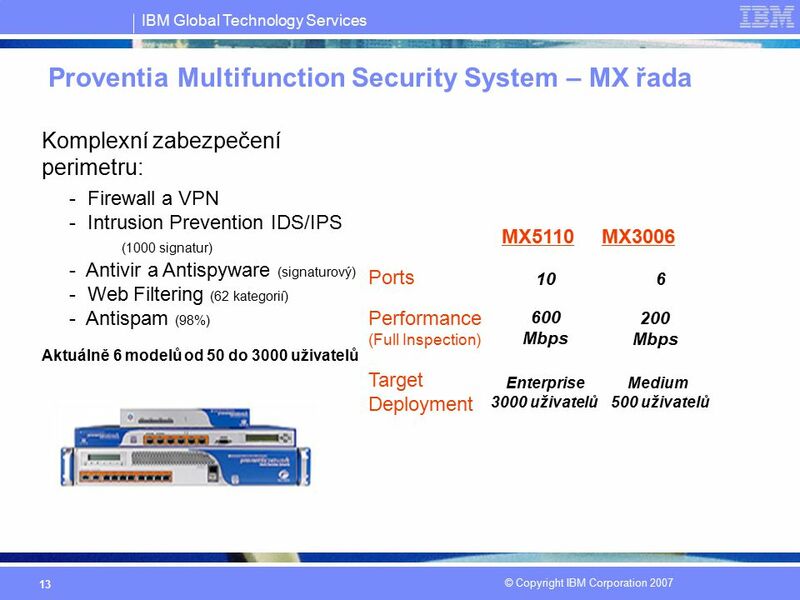 Vydává X-Press update, kterými jsou aktualizovány ISS produkty IBM Internet Security Systems X-Force research and development team The X-Force research and development team is the foundation of IBM Internet Security System's preemptive approach to Internet security. Founded in 1997, the X-Force team is the oldest, best-known commercial security research group in the world. This leading group of security experts researches and evaluates vulnerabilities and security issues, develops assessment and countermeasure technology for IBM Internet Security Systems and educates the public about emerging Internet threats. The X-Force team provides IBM Internet Security Systems with the ability to stop more threats because of its knowledge base of information—understanding the tools and techniques used to create attacks and collaborating with government agencies, industry consortia and software developers. X-Force security intelligence, combined with 24x7 threat tracking and analysis through the IBM Internet Security Systems security operations centers, helps ensure that IBM Internet Security Systems stays ahead of the threat. X-Force Innovation - The X-Force research and development team leverages its superior understanding of vulnerabilities and exploit methods to develop the engines that make preemptive solutions possible, protecting against entire categories of vulnerabilities instead of creating signatures for specific exploits. - The X-Force team discovers and analyzes previously unknown vulnerabilities in critical software and infrastructure such as , network infrastructure, Internet applications, security protocols, business applications and Voice over IP (VoIP). - The X-Force team augments its own findings by collecting data from multiple research sources, researching publicly disclosed vulnerabilities and underground or irresponsibly disclosed 0-day vulnerabilities and analyzing proof-of-concept and exploit code. - The X-Force team monitors and analyzes global Internet threats 24x7 and provides updates on the current global Internet threat level in real time. - The X-Force Vulnerability Database is the industry’s largest and most authoritative vulnerability database. Containing approximately 30,000 entries, with more than 5,100 added in 2005, it includes detailed analysis of every notable public vulnerability disclosure since 1994. - The X-Force team discovered 51 percent of the high-risk vulnerabilities found by commercial security research groups from 1998 to 2005, including the vulnerabilities exploited by the Slammer and Zotob worms. - The X-Force team collaborates with thousands of the world’s leading businesses and governments, vertical sector information sharing and analysis centers (ISACs), global coordination centers and other product vendors. 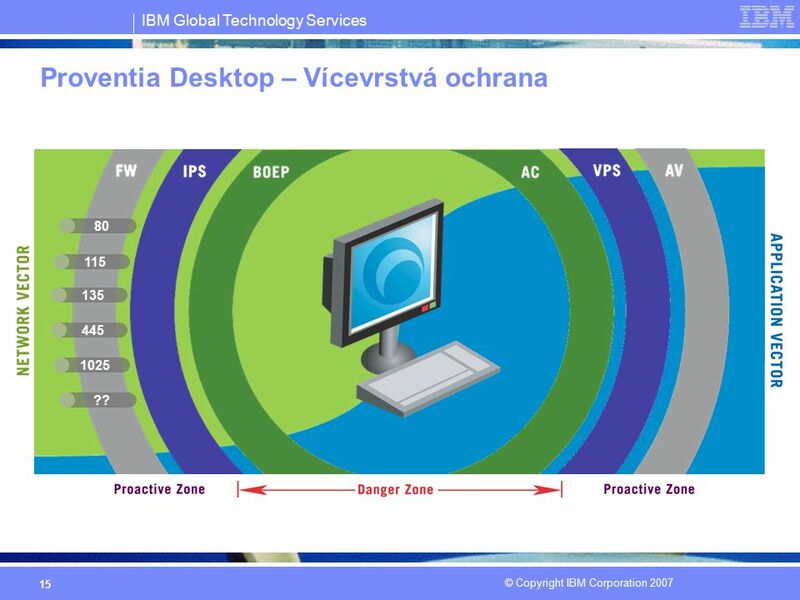 The X-Force research is utilized to build pre-emptive protection from the gateway to the endpoint allowing for threat prevention and shielding or as we like to call it “Virtual patching” until network and system administrators can patch the vulnerable systems within normal maintenance windows. Not reacting to each new threat but rather testing and planning the patching process as the business allows. The Proventia® ESP – a framework for ISS’ products and services ISS focuses on large enterprise security, we don’t do consumer, we don’t build switches – we service the large enterprise and in the large enterprise, security is a normal part of their day to day processes that are required to run a business. In most organizations the business process around security can be viewed as consisting of four basic steps. First is understanding what constitutes the network – what servers, desktops, switches etc… are actually on my network and what is their protection status – we call this vulnerability mapping. ISS invented this space and we have a number of products and services to address this need. The second step is prioritizing what, if anything, needs attention. The network and security tools available today can produce phonebooks of data and being able to make sense of this and extract real and actionable information is critical. ISS provides many tools and solutions to this problem from our Fusion correlation engine to the X-Force critical risk index which is integrated into SiteProtector. The third area is where the bulk of ISS products and services reside and this is the process of shielding and remediation. 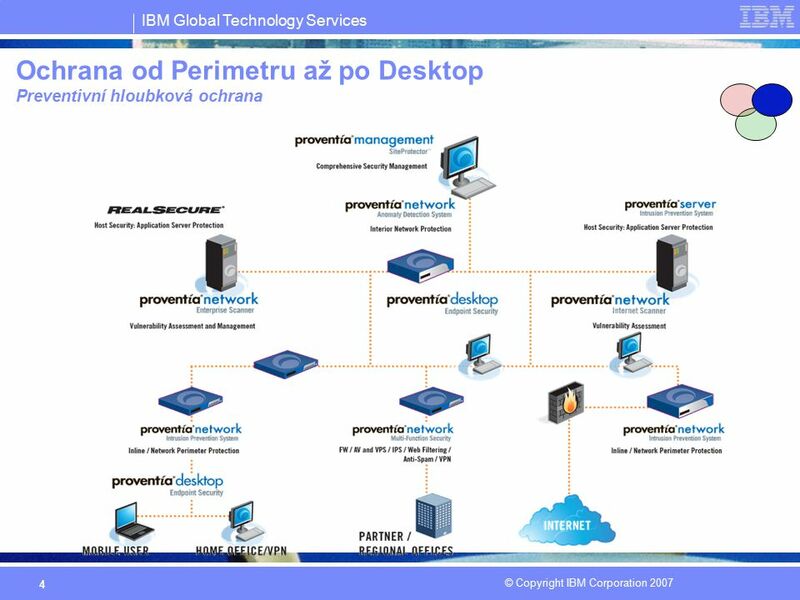 It encompasses protection products such as our Proventia G or our host based products like Proventia server or desktop. It also represents the process around remediation – this is typically referred to a “work flow”. ISS has integrated workflow capabilities in SiteProtector and also integrates with the leading workflow tools such as Remedy. 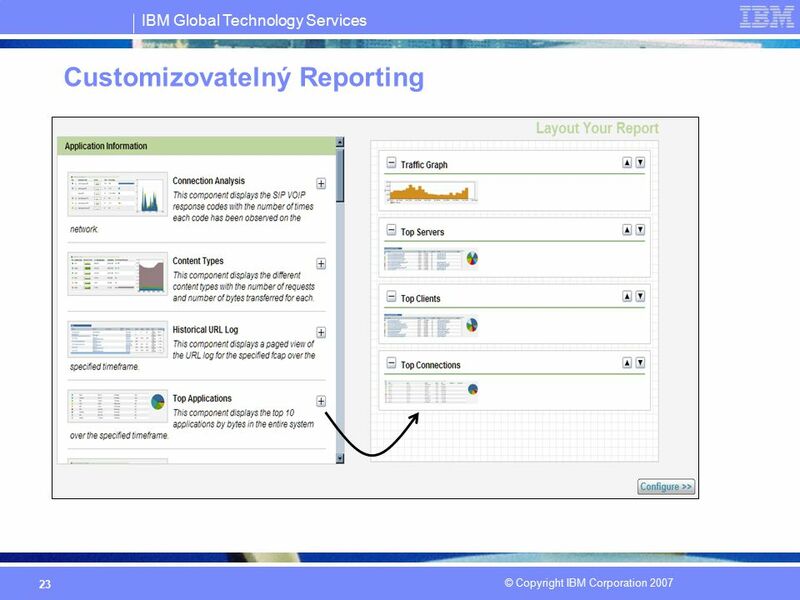 Finally the ability to benchmark and report is critical – if you cannot show the value of your solution then the rest is worthless. We have a heavy focus on reports that span all the way from the front line analyst to the C-level. Both integrated in SiteProtector or through our web based MSS portal. All of this is backed up by Professional services and can be delivered either as Product, as a service or a combination of both. All of the products and services ISS delivers are built upon the core foundation of security research. Without a fundamental knowledge of security and without a constant finger on the pulse of the bad guys – any security solution is a house built on a foundation of sand. ISS builds upon the X-Force, the acknowledged premier research team in the world, as the basis for our products and solutions. ISS’ protocol analysis engine (PAM) provides preemptive protection against most network initiated attacks. For instance, understanding how Telnet works and specifying maximum thresholds in login credentials means that it is possible to preemptively protect against any Telnet overflow in the login sequence – regardless of the vendor, platform, version, etc. Understanding how application attacks such as SQL Injection and Cross-site Scripting (XSS) work, and being able to parse the HTTP protocol correctly (including the removal of noise and obfuscation techniques) means that PAM can preemptively protect against whole classes of attack, without having to write a specific vulnerability decode. PAM provides more than just vulnerability coverage, it also does incredible things with sanitizing data streams and automatically handles encoding systems etc. – which mean that obfuscation techniques designed to bypass signature engines do not apply to PAM. Behavioral analysis enables ISS to detect and defend against actions likely to be malicious. This preemptive technology prevents exploitation of vulnerabilities associated with local-host attacks such as privilege escalation and file format vulnerabilities. ISS’ VPS engine provides a number of advanced virtualization engines capable of detecting vulnerability exploitation in office documents, executable content, etc. A sizable percentage of vulnerabilities can only be exploited in a certain way. For instance, a buffer overflow in the WordPerfect conversion filter of Microsoft Word can only be affected through a malicious Word document. VPS is able to parse and virtualize the Word document format and can consequently identify steps that an attacker must take in order to exploit the vulnerability. Buffer overflow detection provides protection against a huge category of vulnerabilities popularly exploited to gain remote compromise of the vulnerable host. ISS’ BOEP technology identifies buffer overflows that (potentially) affect the stack and prevents any exploitation. This preemptive protection covers all new overflow vulnerabilities from being exploited – regardless of the attack vector. In order to exploit a vulnerability (beyond a simple denial of service) the attacker must use shellcode to achieve remote code execution and eventual ‘ownership’ of the vulnerable host. ISS’ preemptive technology, SCH, is capable of heuristically identifying exploit attempts that rely upon shellcode to compromise the host. This technology is the premiere protection against exploitation of vulnerabilities lying in non-executable files (e.g. office documents, HTML, XML, JPEG, MPG, Quicktime, etc.) 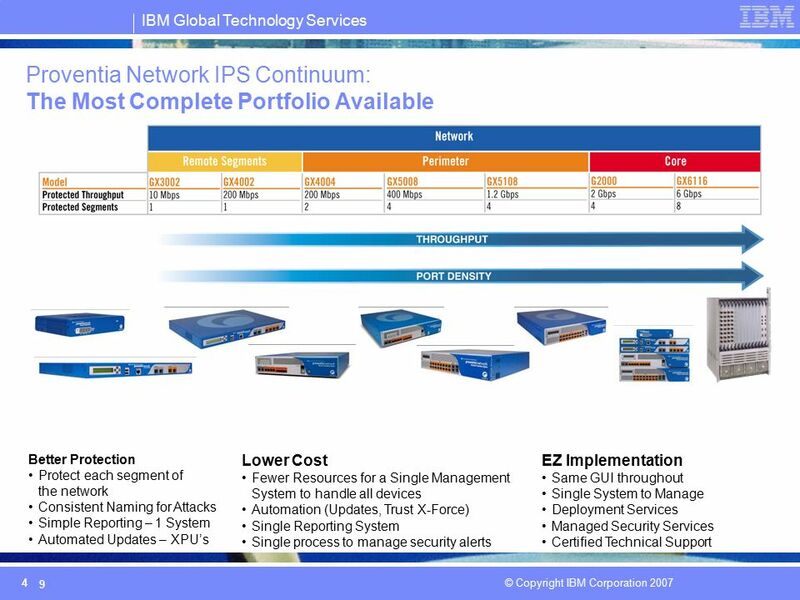 ISS’ XPU system, backed up by X-Force, provides the delivery & update system for all ISS’ protection updates, and focuses on providing vulnerability decodes. Each vulnerability decode is designed to protect the Vulnerability from any/all exploit vectors – rather than trying to provide signature-equivalent protection against a single published exploit. Each year, X-Force focuses on vulnerability decodes applicable to the year in question since our preemptive protection and long history in security means that we already have the lions share of vulnerabilities covered. 8 Proventia Network IPS Zařízení, které umožňuje ochranu před útokem a škodlivými kody, které nejsou odhalitelné standardními bezpečnostními mechanismy Další vrstva ochrany vedle firewallu a antivirových systémů V závislosti na typu zapojení funguje buď v IDS modu /detekce útoků a obsluha rozhodu o následné akci/ nebo IPS modu – dochází automaticky k zablokování útoku Široká škála modelů, které se liší propustností, počtem portů, latencí, redundancí. Možnost dékodovat přes 200 protokolů a datových formátů Virtuální patching, (ochrana zranitelných – neopatchovaných systémů) využívá X-Press updaty Ochrana před známými i neznámými útoky. Reakce na útok: Block, Quarantine, Ignore, Log Evidence, SNMP, User-Specified Jednotný management použitelný nejen pro síťové IPS, ale i vulnerability skenery, host IPS pro servery a desktopy a další ISS produkty. Zařízení jsou odolná proti výpadkům: Výpadek hardware Výpadek napájení Software failure Možnosti zapojení: Inline Prevention Mode Inline Simulation Mode Passive mode (IDS) Flexible Deployment Options With detection and prevention integrated in a single, centrally managed device, users can easily switch between detection and prevention without disrupting or blocking legitimate network traffic Three modes of operation: Active (inline, blocking), Passive (not inline, no blocking), and Simulation (inline, no blocking) Simulation Mode allows customer to realize the value proposition without risk of impacting business operations. SQL (Structured Query Language) Injection XSS (Cross-site scripting) PHP (Hypertext Preprocessor) file-includes CSRF (Cross-site request forgery) Path Traversal HTTP Response Splitting Forceful Browsing Expands security capabilities to meet both compliance requirements and threat evolution WAF (web application firewall) “like” functionality provides a more scalable and cost effective solution for our customers to protect their web applications while using Rational Appscan to fix them. Network appliances such as our GX and MX series lack SSL inspection and must be paired with an SSL off-loader such as our Websphere Datapower solution. If a smaller scale solution is in order then our Proventia Server or Server Sensor product line also include PAM (including the ILE) and have the same capabilities and most include SSL inspection. Here, you see Proventia Management SiteProtector’s family of functions. It’s remarkable how much SiteProtector does and indeed, still has no match in the marketplace today. For more details on SiteProtector functionality, the datasheet contains a concise list of features that provides a more comprehensive view of all that SiteProtector is and does. Připraveno k nasazení do stávající infrastruktury, bez nutnosti pořizovat další HW,SW HW specifikace: 2U rack, CPU Dual Xeon 2.8 GHz, RAM 4 GB, Disk Space Dual 74 GB Windows Server 2003, Database SQL Server 2005, Quarterly OS Security Updates, Server protection Proventia Server for Windows Umožňuje zpracování až 1mil. 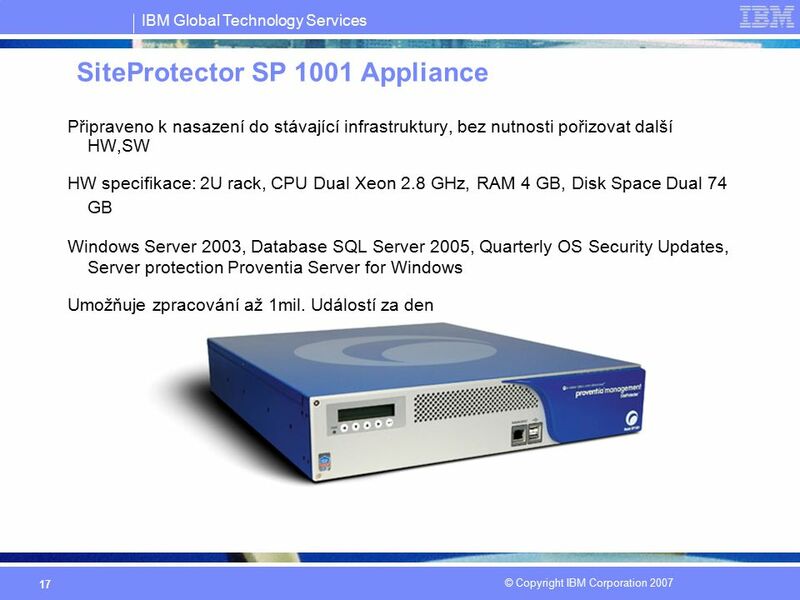 Událostí za den Proventia Management SiteProtector delivers a platform upon which you can build your Enterprise security infrastructure. Add to it as you have budget to grow. We like to call it “room to grow” security. Again, this then enables you to preempt the rising standard of due care. It also enables you to centrally manage, from either one console or from many consoles as segregation of duties sees fit an entire Enterprise mesh of security controls. And because it provides broader scope security management, you can now fully document your security processes. 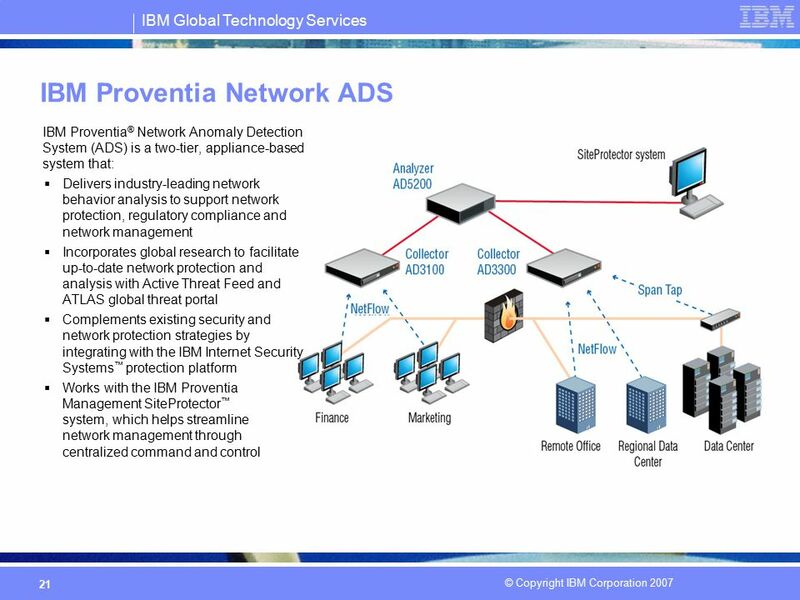 IBM Proventia® Network Anomaly Detection System (ADS) is a two-tier, appliance-based system that: Delivers industry-leading network behavior analysis to support network protection, regulatory compliance and network management Incorporates global research to facilitate up-to-date network protection and analysis with Active Threat Feed and ATLAS global threat portal Complements existing security and network protection strategies by integrating with the IBM Internet Security Systems™ protection platform Works with the IBM Proventia Management SiteProtector™ system, which helps streamline network management through centralized command and control This appliance-based network behavior analysis system is designed to improve network visibility and enable control over critical data, systems and sensitive IT assets to support compliance and protection from insider threats. 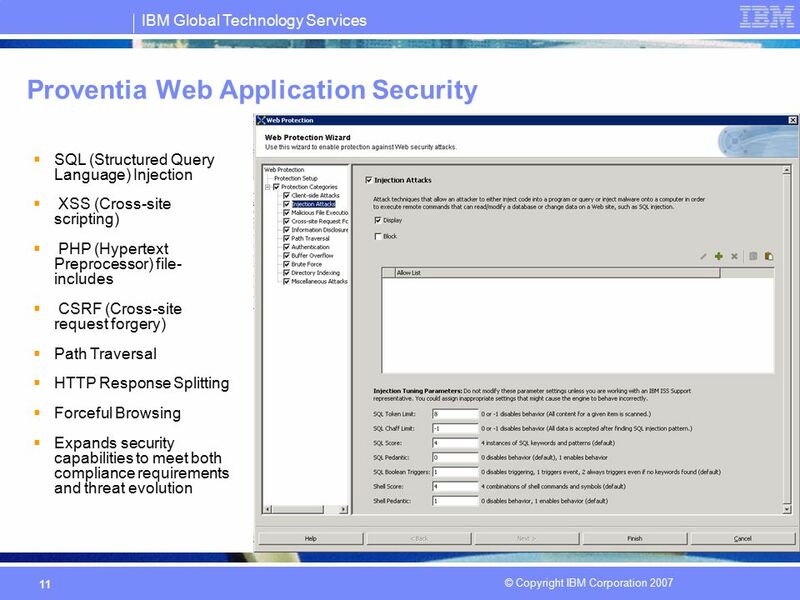 IBM Proventia Network ADS can complement existing security and network protection strategies to provide a layered approach to threat protection. 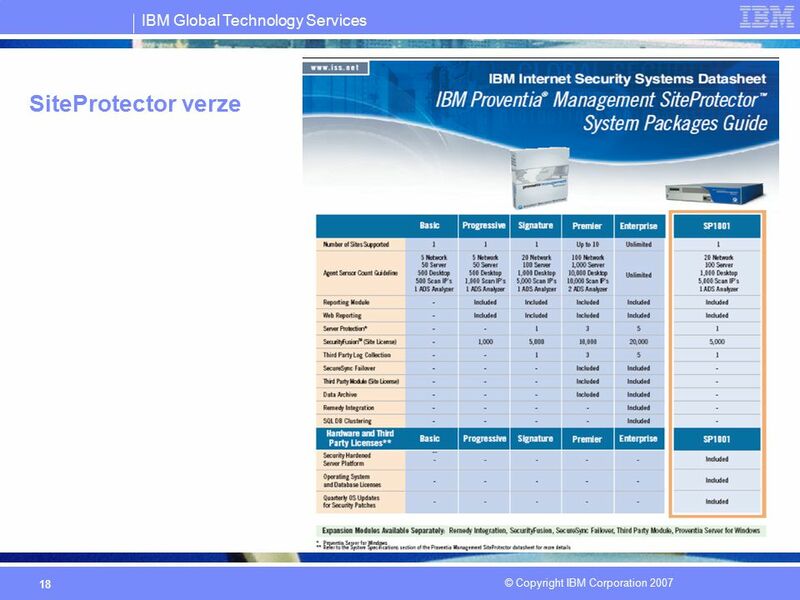 This graphic illustrates how Proventia Network ADS integrates with the IBM protection platform—and works with the IBM Proventia Management SiteProtector™ system, which helps streamline network management through centralized command and control. The solution uses a two-tiered architecture of multiple collector appliances reporting into a single analyzer appliance. The collector appliances collect network flow data from routers and switches and pass the flows to the analyzer. Proventia Network ADS then analyzes this network data to support security and network management by detecting behavior-based network threats. Segue: This network behavior analysis system also incorporates global research to support protection and analysis. Bezpečnostní přínosy Detekce Botnetů, Zero-day síťových červů armies and phishing Ochrana před útoky z řad interních uživatelů – detekce nezvyklých aktivit Možnost korelace s událostmi z dalších bezpečnostních komponent Vysledování nevhodného využívání zdrojů (Skype, YouTube atp.) Další přínosy Monitoring využívání zdrojů Kapacitní plánování (trendování, historické statistiky využítí aplikací) Forenzní – (vysledování příčin chyb, identifikace nedostatečného výkonu atp.) Network behavior analysis helps protect the internal network in a variety of ways: By identifying connections from your clients and servers to both active and hibernating botnets, phishing servers and external networks used by known criminal networks By helping to detect worms based on their propagating behaviors By spotting unusual activity on critical data systems By correlating IPS events and alerts with actual network traffic and comparing client/server vulnerabilities with actual client/server activity And finally, by flagging unprotected network segments Network behavior analysis systems typically perform a benchmark of traffic behavior and monitor for changes. Then if, for example, a relatively unused server begins to propagate many requests, the anomaly detection system might suspect that the host could be falling victim to a worm. Segue: Network behavior analysis also helps companies enforce network policies, controls and compliance. Využití počítačového vybavení - jakýkoliv systém Schopnost uploadování zlomyslných kódů – vysoká propustnost, vysoká úložná kapacita Použití systému jako Hacking Base – jakýkoliv systém Použití systému jako „DDOS attack soldier“ – velký počet systémů, vysoká dostupnost Politický boj Zlomyslnost, Msta, Konkurence Sláva a pověst – systémy s velkou publicitou Rozptýlení a zábava Hackeři mají pro Haking jako takový mnoho důvodů. Některé z nich můžete vidět na slideu. Jsouto například Sláva a pověst. Z těchto důvodů jsou většinou napadány systémy s velkou publicitou nebo popularitou tak, aby hackerovy umožnily sebe prezentovat před širokou veřejností. Dalším důvodem jsou peníze a zisk. To mohou hackeři získat většinou u finančních systémů nebo při „práci na zakázku“. Některé systémy jsou napadány pro vlastní využití počítačového vybavení. Může to být z důvodu výkonu, vysoké úložné kapacity, velké síťové propustnosti nebo pro využití jako hackerské základny či pro vedení DDOS útoky. Mezi další důvody můžeme zařadit Mstu, konkurenční boj, zlomyslnost nebo rozptýlení a zábavu. To se například může týkat bývalých zaměstnanců nebo konkurentů. Konkurenční trh – ztráta pozice Finanční ztráta – hmotné vs. nehmotné ztráty Cena značky – poškození dobrého jména Právní následky – zákonné povinnosti Důvěra zákazníků Popsané hackerské aktivity mají dopad na běžný chod firmy, která jimi byla úspěšně napadena. Může se jednat o ztrátu pozice na trhu například díky prozrazení obchodního tajemnství, finanční ztrátu a to jak hmotnou tak i nehmotnou, poškození dobrého jména. V závislosti na typu citlivých dat může jejich zveřejnění nebo ztráta či podvržení vyvolat právní důsledky. Jedná se například o ochranu osobních údajů, zveřejnění tajných dokumentů či v důsledku ztráty způsobené třetím stranám. V neposlední řadě taková událost může způsobit ztrátu důvěry zákazníků. Instituce a firmy raději informace o takovýchto incidentech nezveřejňují aby zabránily právě takovýmto ztrátám. Simulace chování potencionálního vetřelce Odraz toho, co se může stát v případě opravdového útoku Proces zajištující kontrolu shody směrnic se skutečností Ethical Hacking je simulací chování potencionálního útočníka se všemi jeho projevy. Odráží to co se může v případě opravdového útoku odehrávat. Je to jeden ze způsobů provádění bezpečnostních testů. Umožňuje porovnat to co popisují firemní směrnice se skutečností. Směr vedení testu Předmět testování Black box vs. White box testing Destruktivní nedestruktivní Skrytý vs. Kooperativní Časové vymezení testů Narušení routovacích tabulek, narušení konzistence databáze, prerušení dostupnosti služby. Stáhnout ppt "ISS Koncept řízení bezpečnosti, Ethical Hacking Jan Vaněk"